Kristen: In 2006 I was invited by another artist I collect to join the Eclectic Halloween Artist Group (now Guild), called EHAG for short. It was around that time that I was moving from just collecting mass produced Halloween art to originals. This was back in the days when eBay was king for collecting, before things like Etsy and blog sales. You came on my radar because you were an artist member of the group. Kristen: In 2008 I scored a business trip out to California at the same time as Halloween and Vine (H&V). I was filled with excitement to see all kinds of Halloween originals together in person. I knew I wanted something from JPD and had fun anticipating what I might find at your table. I literally had to push my way in to get a look. 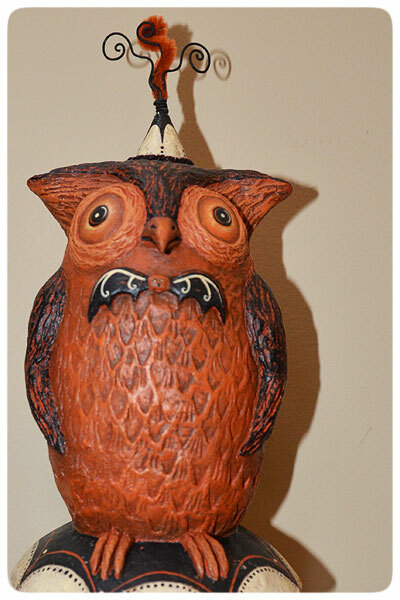 Owls, ravens, and crows have been Halloween favorites of mine so it was no surprise that my first JPD treasure was "Luna Plume," a candy container with a feathered friend top. I was hooked with that first piece. J: Ahh, yes, I definitely remember that day and what a pleasure it was to meet you! I think you were all decked out in Halloween accessories - maybe fuzzy black kitty ears - and you gave me a homemade taffy treat! I do recall you snatching up the black crow piece, and also admiring his owl-themed hat! 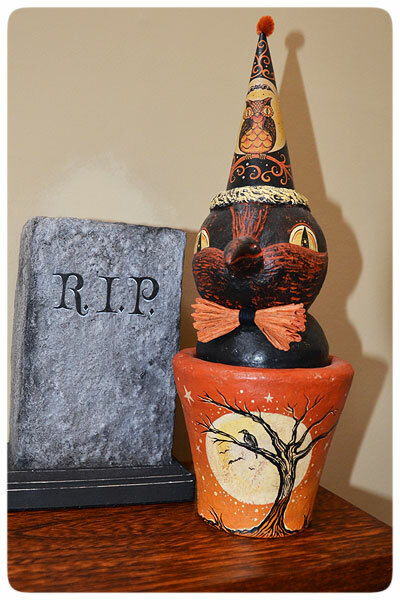 * And there's "Luna Plume" - the inspiration that started Kristen's JPD family of Halloween originals! 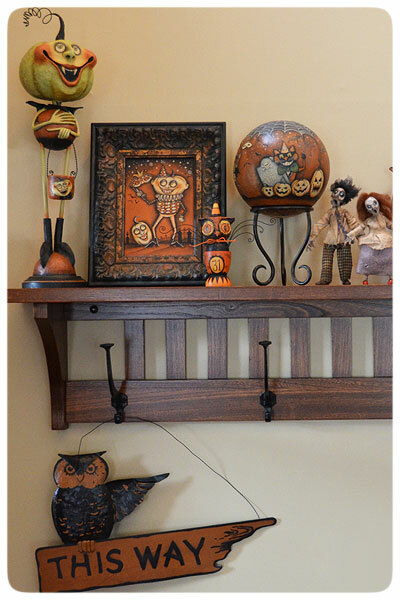 * From Left to Right: "Powlie Panache" perched owl by Johanna Parker Design, baby mummy by Joyce Stahl of Enchanted Productions and of course "Luna Plume" by me again. Grouping spooky fun characters, created from a handful of today's Halloween artists, is a fun way to show the individuality and style of each artist while expressing the common, imaginative theme that we all share! Kristen: Your creations are addicting. I’ve read articles in magazines about how you create your pieces but they leave out the part when the “addiction powder” goes in the paint . I like how they are inspired by the past but not copies of the past. I love how they feel solid, but not heavy in my hands. 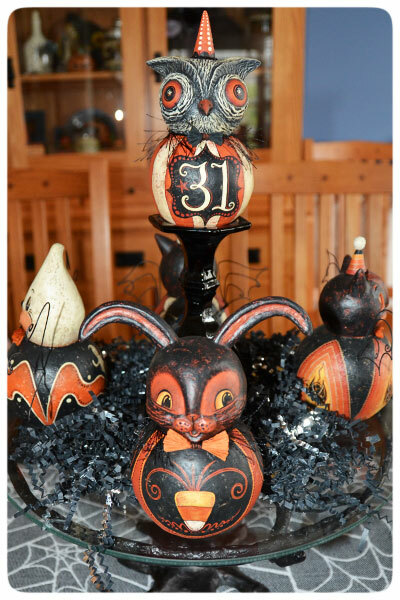 I like how you incorporate non-traditional Halloween creatures such as mice and bunnies. I enjoy seeing new twists come out every year – new colors, adding wire, etc. I like how they have a distinct look so I can immediately tell them apart from other artists. I also enjoy whimsy and your pieces have that. J: Wow, thank you Kristen! I got a chuckle from your "addiction powder" comment! :) You're not the only one that has made a similar remark like that. I'm always under an artist's spell when I paint my pieces, perhaps lost in a whimsical land. Hours can pass by while I paint various details. So, I'm not quite sure what magic is in that paint, but I guess it's working! It has me addicted too! * Close up of "Powlie Panache" - notice the word "owl" in "Powlie"..... :) I can get carried away with naming my originals! Kristen: Every original piece I have is from a show. I’ve been to H&V and Ghoultide Gathering shows several times. I love shows and taking in all the options. Having you or JP hand the bag over to me is the best. I also love the excitement of seeing other collectors snag new goodies for their collections. J: I have to agree that being caught up in the excitement of a show is certainly more memorable. And meeting collectors like yourself is always a treat! 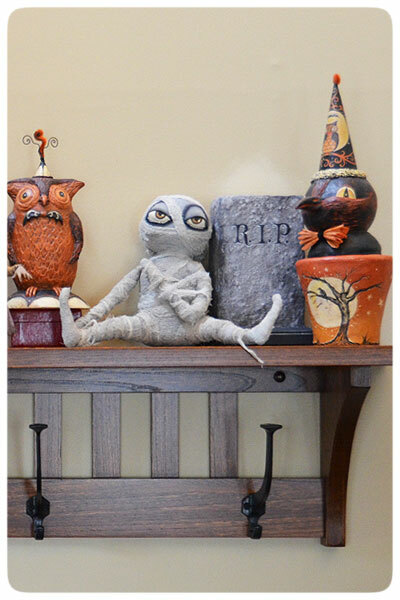 * A delicate owl egg cup character of mine cozies up with other haunting collectibles by fellow Halloween artist friends that I too, have the pleasure of knowing! Kristen: It’s not easy to pick just one, but it is "Hootin’ Newton." Owls are one of my favorites, and I love the big “31” on him. I also like his festive neckwear. Luna Plume is special too because she was my first piece and she has an owl on her hat. * "Spirited Sam," ghost ball character, raises his wiry arms in the foreground, while off in the distance you catch a glimpse of a festive feather tree, adorned in Halloween ornaments! 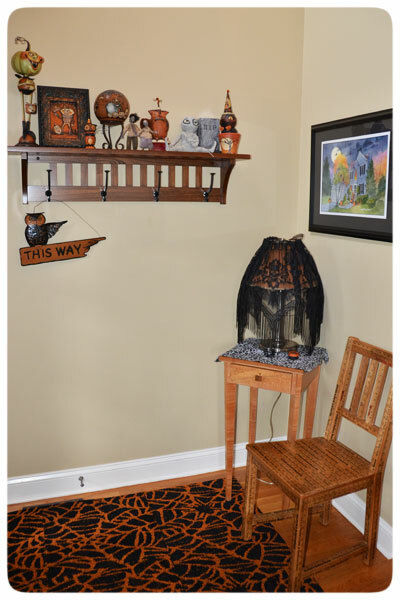 * A spider web table cloth pulls this Halloween scene together while you are greeted by the grinning "Batrice the Spider Keeper! " 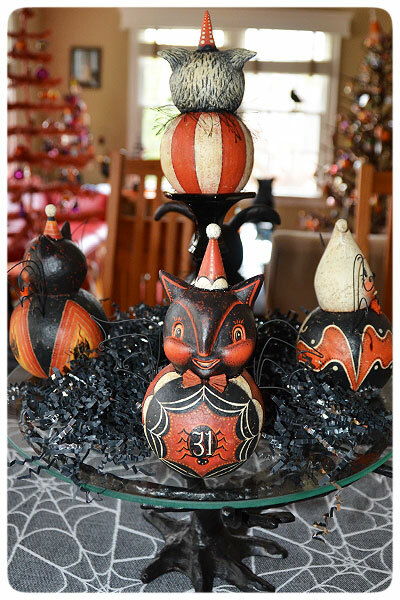 Look beyond to see even more delightful decor filling her home with Halloween magic! Kristen: Yes! I love vultures and you could make an awesome vulture character. I can just see a kindly craggy looking one perched on top of a ball. I’d be first in line to adopt him. * Dining Room Table, Left to Right: Cupcake by Scott Smith of Rucus Studio, Standing Cake by Amelia Schaefer of Sweet B Folk Art, Carmel Apples by David H. Everett of Chicken Lips, various Halloween ball characters by Johanna Parker Design and Candles by William Bezek. Kristen: I missed 2009 because I was too pregnant to travel. My first son was born October 27, 2009. 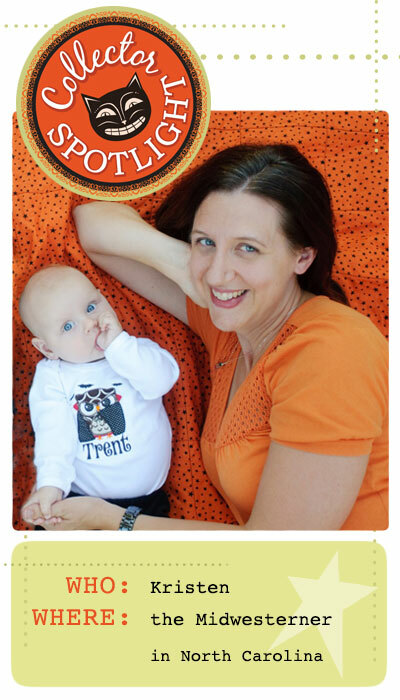 Well, thank you Kristen for sharing your thoughts about your Halloween collection with me! It has been a real treat to see where my creations now comfortably live in your delightful home. You have a designer's eye for decorating, and I am honored that you collect my work and share it with your family and friends. 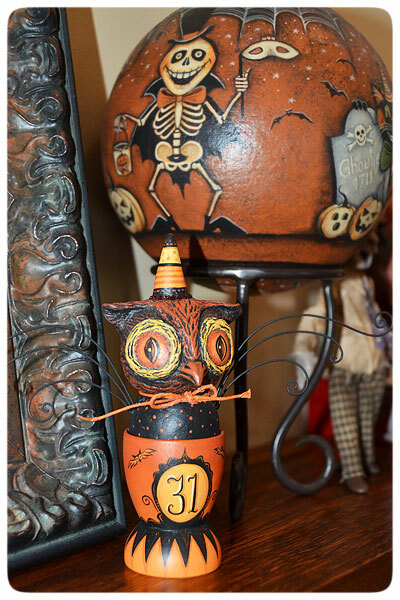 For you, it's clearly become a treasured tradition to deck the home in hand-crafted Halloween art! Thank YOU for visiting my blog! I hope you enjoyed Kristen's photos! You can share your thoughts with Kristen here in the comments portion of this post. Just click the "comments" link below to leave a message for both me and her! Also, if YOU would like to be my next Collector Spotlight and share some photos of your Johanna Parker Design Halloween Collection, I would be honored! I know some folks are a little shy, but if you are willing, then I am too! Please EMAIL me to start the simple sharing process! 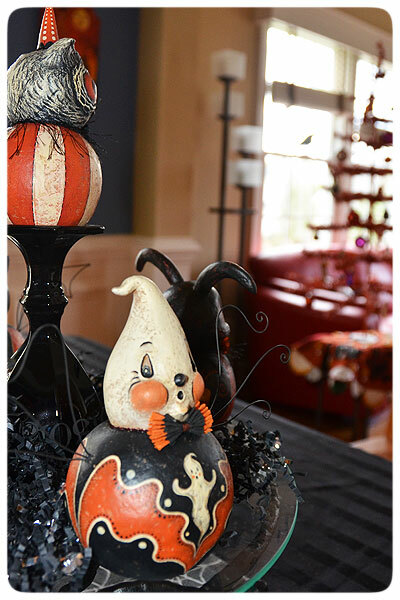 Happy Halloween Decorating ~ 'tis the season!